The NFL’s biggest game, letdown, upset, and surprise of week 4? > News > The NFL’s biggest game, letdown, upset, and surprise of week 4? 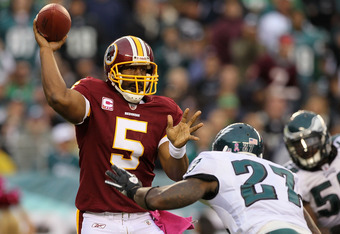 The biggest game for me was no doubt the Washington Redskins taking on the Philadelphia Eagles. Donovan McNabb going back to Philly to take on his former team in a classic NFC East showdown = Game of the Week. Not the prettiest of games, but a great win for McNabb and his team. Not only a disappointing loss for the Eagles, but an even bigger disappointment came toward the end of the 1st quarter when Michael Vick suffered a rib injury on a 23 yard run to the Washington 1 yard line. The play was called back due to an Eagles hold at the 24 yard line and Vick is expected to miss 1 to 2 weeks. The Skins improved to 2-2 while the Eagles moved to 2-2 as well. Final score - Washington 17, Philadelphia 12. The biggest letdown was the Cincinnati Bengals losing to the Cleveland Browns. Of course, I could always put the team that loses to the Browns in this particular category because it’s always a letdown to lose to those guys. But come on Cincy, the Browns?! I thought you guys were better than that? It’s going to be hard to make a run at a Superbowl if you can’t even handle the Browns. OK, I’m done with my rant on the Bengals. I guess it goes back to the fact that anyone can beat anyone this year. Question is, are the Browns “someone”? Final score Cincinnati 20, Cleveland 23. The biggest upset was the Jaguars taking down the Colts and handing them their 2nd loss of the season after only 4 games. The Colts are going to have to play better defense if they’re going to make it to the playoffs this year. They are allowing 217 passing yards a game and 150 rushing yards a game. Peyton Manning is inarguably the best QB in the league; however, he can only do so much, and being a bad a$$ QB doesn’t keep the other team from running and throwing the ball all over your defense. A great game and win for the Jags at home against the defending AFC champs. Final score Indianapolis 28, Jacksonville 31. Finally, my biggest surprise came from last night’s Monday Night Football game with the New England Patriots taking on the Dolphins in Miami. Both teams were 2-1 going into the game and looking pretty good in 2 of their first 3 games. Which is saying a lot when talking about the Dolphins, but after last night, opinions may be changing about how good the Dolphins really are. I mean, I’m not trying to take anything away from the Patriots, but the Dolphins actually had somewhat of a game when halftime rolled around with a 1 point lead over the Pats. But holy dang…New England straight up put a smack down on those little fishies from Miami in the 2nd half, outscoring them 35 to 7. Does New England still have it, yeah I think so. Miami? Nah, not so much. Final score Patriots 41, Miami 14.